Deuteronomy 3:11 states that the bed of Og, king of Bashan, was 9 cubits by 4 cubits (approximately 14 ft long by 6 ft wide). Now this is a discovery, isn’t it? Many people cannot understand how “God” would be so “mean” to extinguish the earths population at the time of Noah’s flood. Here is some archeological proof of why that happened. A 23-foot tall skeleton found in 1456 A.D. beside a river in Valence, France. A 9′ 8″ skeleton was excavated from a mound near Brewersville, Indiana (Indianapolis News, Nov 10, 1975). In 1833 soldiers digging at a pit for a powder magazine in Lompock Rancho, California, discovered a male skeleton 12 feet tall. The skeleton was surrounded by carved shells, stone axes, and blocks of porphyry covered with unintelligible symbols. The skeleton had double rows of upper and lower teeth. These bones substantiated legends by the local Piute Indians regarding giants which they called Si-Te-Cahs. In Clearwater Minnesota, the skeletons of seven giants were found in mounds. These had receding foreheads and complete double dentition. In 1932, Ellis Wright found human tracks in the gypsum rock at White Sands, New Mexico His discovery was later backed up by Fred Arthur, Supervisor of the Lincoln National Park and others who reported that each footprint was 22 inches long and from 8 to 10 inches wide. They were certain the prints were human in origin due to the outline of the perfect prints coupled with a readily apparent instep. During World War II, author Ivan T. Sanderson tells of how his crew was bulldozing through sedimentary rock when it stumbled upon what appeared to be a graveyard. In it were crania that measured from 22 to 24 inches from base to crown nearly three times as large as an adult human skull. Had the creatures to whom these skulls belonged been properly proportioned, they undoubtedly would have been at least 12 feet tall or taller. In 1947 a local newspaper reported the discovery of nine-foot-tall skeletons by amateur archeologists working in Death Valley. The archeologists involved also claimed to have found what appeared to be the bones of tigers and dinosaurs with the human remains. The Catalina Islands, off California, are the home of dwarf mammoth bones that were once roasted in ancient fire pits. These were roasted and eaten by human-like creatures who were giants with double rows of teeth. Large bones in stone graves in Williamson County and White County, Tennessee. Discovered in the early 1800s, the average stature of these giants was 7 feet tall. Giant skeletons found in the mid-1800s in New York state near Rutland and Rodman. In 1833, soldiers digging at Lompock Rancho, California, discovered a male skeleton 12 feet tall. The skeleton was surrounded by caved shells, stone axes, other artifacts. The skeleton had double rows of upper and lower teeth. Unfortunately, this body was secretly buried because the local Indians became upset about the remains. A giant skull and vertebrae found in Wisconsin and Kansas City. A giant found off the California Coast on Santa Rosa Island in the 1800s was distinguished by its double rows of teeth. A 9-foot, 8-inch skeleton was excavated from a mount near Browerville, Indiana, in 1879. Skeletons of “enormous dimensions” were found in mounds near Zanesville, Ohio, and Warren, Minnesota, in the 1880s. At Le Crescent, Wisconsin, mounds were found to contain giant bones. Five miles north near Dresbach, the bones of people over 8 feet tall were found. In 1888 seven skeletons ranging from seven to 8 feet tall were discovered. Near Toledo, Ohio, 20 skeletons were discovered with jaws and teeth “twice as large as those of present day people.” The account also noted that odd hieroglyphics were found with the bodies. In 1931, skeletons from 8 ½ to 10 feet long were found in the Humbolt lake bed in California. Are all of these individuals crazy? Are they imagining things? Are they lying? The internet is overflowing with the stories of these people. Are they really interacting with beings from another world? Or is something more sinister at work here? So what were the “days of Noah” like? Well, certainly those days were very evil, and mankind was full of wickedness. This is truly one of the more extraordinary verses in the Bible. What was taking place during that time is that fallen angels were literally coming to earth and mating with human women and having offspring. Their offspring were mighty and powerful and were the giants of ancient lore. This phenonmenon is described in much more detail in the ancient Book of Enoch (which is quoted in the New Testament book of Jude). Apparently Satan’s plan was to pollute human DNA so that the promised Messiah could never come forth. 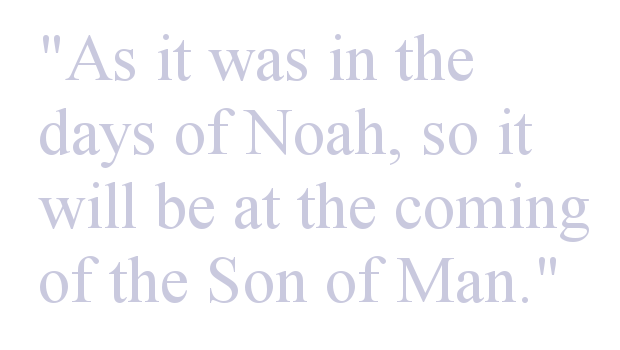 That is why God chose Noah. Genesis 6:9 describes Noah as “perfect in his generations”. That doesn’t mean he was without sin. It means his DNA had not been corrupted by the fallen angels yet. 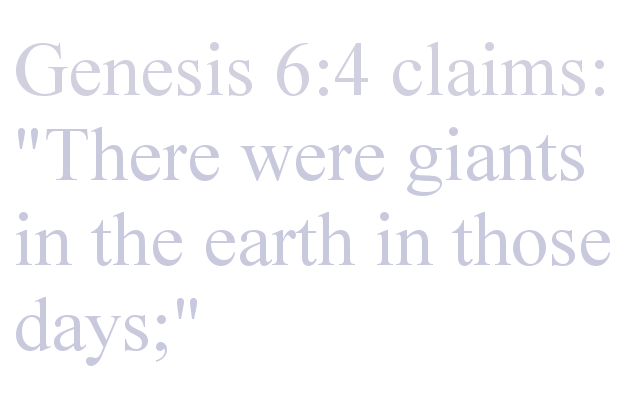 That is why God had to destroy the earth. To preserve the human race through Noah and his family, and to destroy the offspring of these fallen angels. But Satan wasn’t done. Apparently the fallen angels tried again, as in Genesis 6:4 it says “and also afterward”…..so the Nephilim were also around after the flood. That is why God had the people of Israel wipe the nations of the promised land out. They were of the Nephilim. Satan had filled up the land of Israel with this wickedness so that the Messiah could never be produced there. In fact, the giant Goliath that David killed was also a descendant of these Nephilim. These are the same subjects that the Watchers (fallen angels) of the Book of Enoch were so fascinated with. Could we be witnessing the return of the Watchers in our very lifetime? What are your thoughts? Leave your response to this article in the comments section.